A charming story in rhyme, about which things are alive, and which are not. 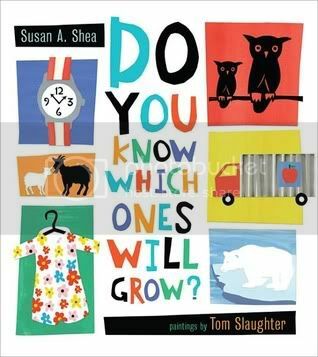 Funny and inventive, the book asks, "If a duckling grows and becomes a duck, can a car grow and become... a truck?" "If an owlet grows and becomes and owl, can a washcloth grow and become... a towel?" Every few pages or so, readers are treated to another surprising set of rhymes, letting them know (if they weren't sure already) the answers to these little riddles: "YES to ducks, bears, and owls. NO to trucks, chairs, and towels. YES to cats. NO to hats. YES to goats. NO to coats." Bright, easy to see, bold illustrations complement the text nicely, and the illustrator has made nice use of the fold-out pages which visually transform the items into something else: cupcakes into cakes, or dresses into coats for instance. The fold-out pages are certain to take a beating for library, or even home use, but I still think this is a worthwhile purchase because the predictive rhymes are so enjoyable. This is a sure-bet for a fun storytime. I agree--this is a great little read-aloud. We just had the author at our store to do a storytime for our summer children's programming and it was great fun! Kids are so funny... I read this, and I swear they were so proud of themselves for "knowing" which ones were wrong.